Manchester(AFP): Lionel Messi begins his road to World Cup redemption on Friday as Argentina take on Italy in a glamour friendly, desperate to win a major international prize to crown his glorious career. In Barcelona’s colours, Messi has experienced nothing but success, winning eight La Liga titles and four Champions League crowns, while earning FIFA’s Ballon d’Or award five times. But pulling on Argentina’s blue-and-white striped shirt has brought the forward some of the most painful moments of his career. Rarely able to hit the same heights with Argentina that he routinely scales with Barcelona, Messi has endured stinging criticism from ‘Albiceleste’ fans at times. Nobody would dispute Messi’s status as one of the all-time greats, but many in Argentina believe he cannot be considered on the same level as Diego Maradona until he wins a major honour with his country, as his compatriot did at the 1986 World Cup. Rubbing salt into those wounds, Messi has lost in three successive major finals with Argentina as the 2014 World Cup and the 2015 and 2016 Copa America titles slipped from his grasp. “I cried many times because of games like these, for lost finals, for what they mean and for not being able to achieve the dream of a country. 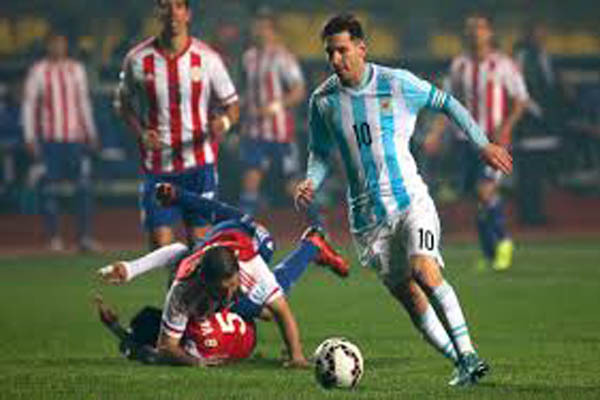 It was a hard blow to take,” Messi recently told Argentine television programme La Cornisa. The last World Cup was devastating to Messi as he missed a golden opportunity to put Argentina ahead in the final against Germany, who went on to win 1-0 in extra-time. As if that was not bad enough, for the first time in his career, he missed in a penalty shootout when Argentina were beaten by Chile in the Copa America final two years ago. Although Messi is still in his prime, the 30-year-old realises the World Cup in Russia, which starts in June, could represent his last chance to hoist the famous gold trophy. He will be approaching the twilight of his career by the time the 2022 edition kicks off in Qatar. Messi will have also noted that key Argentina team-mates Sergio Aguero, Gonzalo Higuain, Angel Di Maria, Nicolas Otamendi and Javier Mascherano will all be 30 or over this year. “Obviously, we depend on results and therefore the thinking in this group is that having got to three finals and not being able to win and even then people say a lot of things about us, if we are not champions then we won’t have another one (opportunity),” Messi said. Having edged through to the finals thanks to Messi’s treble in a 3-1 win over Ecuador in October, Argentina are focused on peaking in Russia, where they will play Croatia, Iceland and Nigeria in the group stage. First up is an intriguing test against an Italy side that failed to qualify for the World Cup. Argentina boss Jorge Sampaoli believes the match at Manchester City’s ground will help to sharpen his side before a second friendly in Spain next week. “Each match and training session is fundamental for us in preparation for the World Cup. Playing against Italy, in a venue as important as Etihad Stadium, is an invitation to a great event,” he said. “Every Argentine in the world wants to be there when the national team plays. We are certain they will accompany us for this one. while earning FIFA's Ballon d'Or award five times. But pulling on Argentina's blue-and-white striped shirt has brought the forward some of the most painful moments of his career.